John Owen Brennan (born September 22, 1955) is an American politician. He was the Director of the National Counterterrorism Center from August 2004 through August 2005. Then he was United States Homeland Security Advisor from January 2009 through March 2013. He became the director of the Central Intelligence Agency on March 8, 2013. Brennan was born on September 22, 1955 in North Bergen, New Jersey to an Irish-American family. He studied at Fordham University and at the University of Texas at Austin. Brennan is currently married to Kathy Pokluda. He now lives in Washington, D.C..
↑ Amanda Erickson (January 7, 2013). "Profile: John O. Brennan". Who Runs Gov. The Washington Post. ↑ Niall O'Dowd (June 6, 2010). "John Brennan, son of Irish immigrants, now Obama's top gun". Irish Central. Retrieved October 31, 2010. 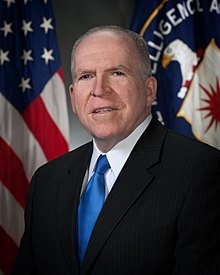 Wikimedia Commons has media related to John O. Brennan. Shane, Scott (March 5, 2013). "Senate Committee Approves Brennan for C.I.A. Director". The New York Times. Cole, David (February 21, 2013). "13 Questions for John O. Brennan". New York Review of Books. "Text of John O. Brennan's Speech on Drone Strikes at the Wilson Center". Lawfare. April 30, 2012. Lake, Eli (June 24, 2010). "Dozens of Americans believed to have joined terrorists". Washington Times. Retrieved February 25, 2013. "Q&A: John Brennan - The Counterterror Campaign". National Journal. March 7, 2008. Retrieved February 25, 2013. "The Dark Side: Interviews - John Brennan". FRONTLINE. June 20, 2006. This page was last changed on 31 August 2017, at 04:58.